Pratice Fluid Mechanics questions and answers for interviews, campus placements, online tests, aptitude tests, quizzes and competitive exams. This set of Fluid Mechanics Multiple Choice Questions & Answers (MCQs) focuses on “Similitude – Types of Similarities”. Explanation: Similitude is an essential concept that is applicable to the testing of basic engineering models. A model has a similitude with a real-time application. It shares the same geometry. Similarity and similitude are interchangeable at times. 2. Which among the following is the main application for Similitude? Explanation: Similitude plays an important role in various applications. One of the major applications are hydraulics and aerospace engineering. Its main purpose is to test the fluid flow at different conditions of scaled model. 3. Which among the following is not a criteria to achieve similitude? Explanation: The criteria required to achieve similitude are geometric similarity, kinematic similarity and dynamic similarity. All these similarities play a major role in regard with the real-time applications. Similarity and similitude are interchangeable at times. Explanation: Geometric similarity is a similarity that follows a real-time application. It is model that has the same shape for any sort of application. It is measured in scaled quantities. 5. Which among the following have similar fluid streamlines? Explanation: In kinematic similarity, fluid flow of model and real-time application takes place. Here, the model and the real application must undergo similar time rates in motion changes. Thus, it has similar fluid streamlines. 6. Which among the following have the same forces acting on them? Explanation: Dynamic similarities have the same forces acting on them. That means, the ratios of all the forces acting on the fluid particles are constant. Also, the ratio of the forces acting on the boundary surfaces are also a constant. Explanation: A branch of mechanics that deals with the analysis of mechanical behaviour of materials and kinematics of materials. They are used for modelling purposes. It is modelled in continuous mass. 8. Physical similitude has exactly the same geometric shape of the prototype. Explanation: Physical similitude is also called the similitude of shape. It is for modelling the same geometric shape as that of its prototype. Which means, that the shape will have to be divided by a scale factor. 9. Which among the following is a standard scale for a similitude? Explanation: To design a similitude with a specific dimension, we must fix a scale. The standard system has fixed the scale as 1:25. This was fixed for an uniformity in dimensions. Explanation: A model test was conducted to determine this relation. The force and velocity that were measured in the model are to be scaled. This helps to find the force that can be expected for a real-time application. 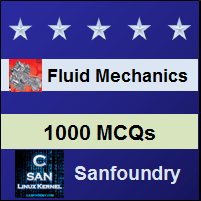 Sanfoundry Global Education & Learning Series – Fluid Mechanics. To practice all areas of Fluid Mechanics, here is complete set of 1000+ Multiple Choice Questions and Answers.